These are the perfect from-the-pantry cookies. Nothing too fancy or specialized ingredient wise and they taste phenomenal. I threw these cookies together last week when a girlfriend was coming over for a catch up. I had an OMG moment when I realized I didn't have anything yummy to offer her. These cookies take only a few minutes to make and most of the prep happens in the food processor. No annoying rolling out or cutting of dough. The texture is lightly crisp on the outside and chewy inside. Nut butter (of any variety) makes an excellent cookie base. It binds the cookie together and makes them really lovely and rich. My partner - who is my toughest critic as well as loudest cheerleader - LOVES these. 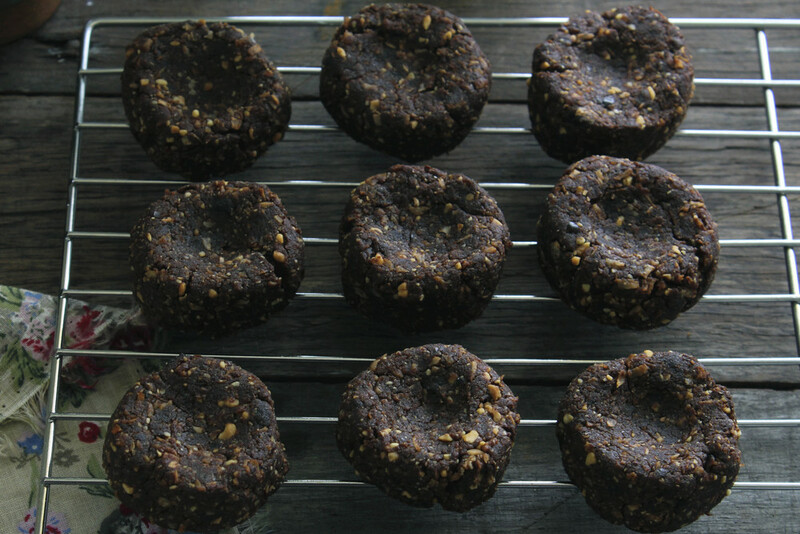 This recipe is egg, dairy and gluten free with just dates and a little honey to sweeten. I had one for breakfast this morning. More restrained types might hold out and enjoy them as an morning or afternoon tea treat. 3/4 cup dates - soaked for 10 minutes prior in hot water and drained well. Place the coconut and dates into a food processor. Blitz until the dates are a rough puree. Add the remaining ingredients and process until well combined. You will probably need to scrape the side of the mixing bowl intermittently. Use a heaped teaspoon of mixture to create small disc shaped cookies. Place your cookies on a lined baking tray. Use your thumb to gently press an indent into the top of each cookie. (This looks sweet and helps then cook more evenly). This mixture will make 15-18 cookies. Bake for approx 12-15 minutes. Watch the cookies carefully. They burn easily. Leave the cookies to cool completly before moving. Store up to 5 days in an airtight container.